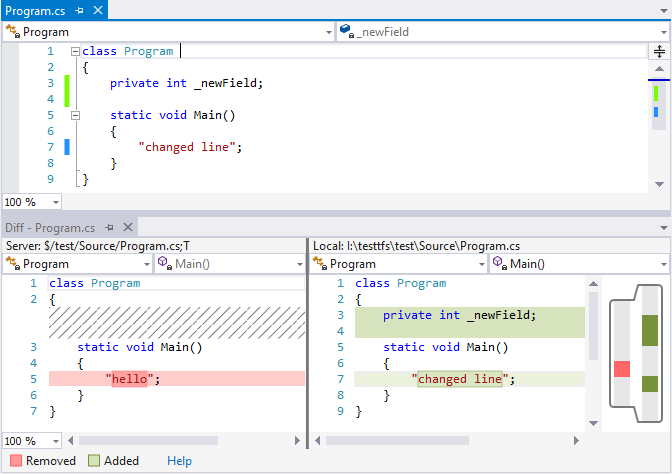 A Visual Studio extension to display TFS Pending Changes on the margin of the current file. Quickly view all current file changes on the left margin and on the scroll bar margin: blue rectangle for modification, green rectangle for new lines and red rectangle for deletion (color settings). Please report all problems or feature requests you might have on the following page. % Fix references to make it work with VS2015 without installed VS2013 (#17 and 2e93719). % Fix margin missing in html/cshtml files. 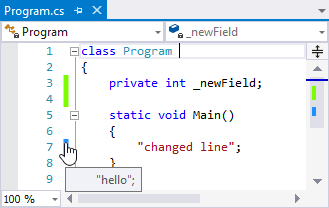 + Support for Visual Studio 2015. + Options Dialog to configure IgnoreLeadingAndTrailingWhiteSpace (Tools - Options... - Tfs Pending Changes Margin). % Fix document disposing before margin rendered (fixes ReSharper navigating). % Fixed: no differences if rename the file. ~ Disable copying commited text if diff inserted. 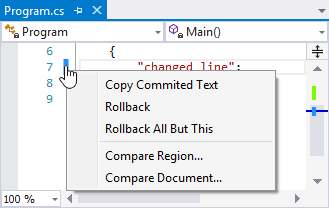 + Menu for the editor margin (items: "Copy Commited Text", "Rollback", "Rollback All But This", "Compare Region...", "Compare Document..."). + The margin tooltip for preview a difference. + The margin on the Enhanced Scrollbar. % The margin wasn't refreshed after a span collapse. % The margin wasn't rendered the first time (seldom). ~ Redrawing is a little optimized. % Fixed: Line number is out of range (mistiming of the changed lines and the current version of the document). % IgnoreLeadingAndTrailingWhiteSpace value was confused with IgnoreWhiteSpace in version 1.0.2. ~ Getting changed lines reworked. % Fixed bug with margin position. % Fixed bug with margin disposing. + Ignore trim whitespace in diff. % Various minor bug fixes.